The Third Amendment was introduced in Congress in 1789 by James Madison. It was a part of the United States Bill of Rights in response to Anti-Federalist objections to the new Constitution. 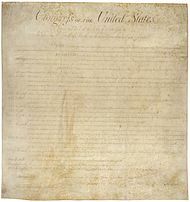 Congress proposed the amendment to the states on September 28, 1789. By December 15, 1791, the necessary three-quarters of the states had ratified it. Secretary of State Thomas Jefferson announced the adoption of the amendment on March 1, 1792. The amendment is one of the least controversial of the Constitution and is rarely litigated. The American Bar Association called it the "runt piglet" of the U.S. Constitution. There were times when the US government probably violated this amendment. These include the War of 1812, the American Civil War, and during World War II in the Aleutian Islands. But as of 2015 it has never been the primary basis of a Supreme Court decision. ↑ 1.0 1.1 1.2 "How Did America's Police Become a Military Force On the Streets?". American Bar Association. 2013. Retrieved 27 January 2016. ↑ Mahoney, Dennis J. (1986). "Third Amendment". Encyclopedia of the American Constitution. – via HighBeam Research (subscription required). Retrieved 27 January 2016. ↑ "Third Amendment". U*X*L Encyclopedia of U.S. History. – via HighBeam Research (subscription required). January 1, 2009. Retrieved 27 January 2016. This page was last changed on 9 July 2016, at 07:14.